"Tempest was an excellent band formed by jazz-rock drummer Jon Hiseman after the demise of his earlier band Colosseum in 1971, which happens to be one of my favorite drummers who I think is extremely underrated! Completing the group's first line-up was guitarist Allan Holdsworth, bass player/singer Mark Clarke, and Paul Williams on lead vocals. After the recording of their self-titled debut, both Williams and Holdsworth left reducing the band to a trio consisting of Ollie Halsall (guitar/keyboards/vocals), Mark Clarke (bass/vocals), and of course Jon Hiseman (drums). This is the line-up that recorded the second album "Living In Fear". 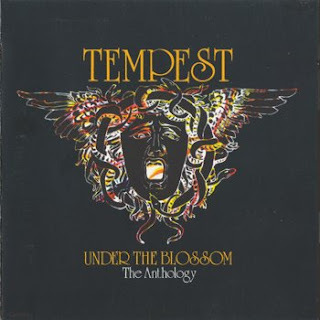 In this compilation "Under The Blossom", are included the band's two albums ("Tempest" 1973, "Living In Fear" 1974), a previously unreleased BBC live recording, and two excellent outtakes from an aborted third album the band was working on, when they decided to call it quits. The self-titled debut from 1973 is an awesome collection of blues-rock, jazz-fusion, and prog-rock. All the eight songs have something memorable about them and what really got my attention aside from the drumming of Jon Hiseman, was Holdsworth's distinctive chord voicings and great soloing technique. Highlights include "Up And On" featuring some great riffs and melodies, the ballad "Grey And Black", and the somewhat dark sounding "Brothers" with a notable vocal performance by Williams. The arrival of Halsall on guitar and keyboards brought a slight change of direction on the 1974 released second album "Living In Fear". The results are nothing short of excellent though! Here, the band goes for a more hard-rock and pop approach. Note how Hiseman also alters his drumming style for the new sound. His playing is less busy and leans more toward straight beats proving how underrated as a drummer he is. Stand out tracks include the unexpected Beatles cover "Paperback Writer", the awesome album opener "Funeral Empire", the poppy "Yeah Yeah Yeah", the seven-minute epic "Dance To My Tune" that features a stunning guitar solo by Halsall, and the acoustic number "Waiting For A Miracle" which is sung by bass player Clarke. The live BBC session is an incredible listening experience that it's made even better by the fact that both guitarists Allan Holdsworth and Ollie Halsall get to play together here! As a result the band stretches out with the arrangements to include excellent jams that showcase the interplay between the two players perfectly. Drummer Hiseman gets to play a seven minute drum solo as well. Too bad the set list only includes songs from the first album though... But that's only a minor complain. Even the two outtakes are well worth hearing. "You And Your Love" is a charged rocker with funny lyrics but "Dream Train" is truly a pop gem! This is one of the best songs on the album! An unforgettable vocal duet between Halsall and Clarke is included, very catchy melodies, plus a melodic solo at the end too! I discovered your blog quite by accident. I'm glad I did... it's a good one! I downloaded Fleetwood Mac's Kiln House. I bought that one vinyl when it first came out so that hints at how old I am. It sounds as good as I remember it. I always thought that was one of their best records. I'm going to check out Tempest. I don't know them at all. Thank you... I'll be back. As always Garcolga, thank you for your awesome blog. I've enjoyed it all summer since discovering it. What a find ! had no idea about this group and I agree with you that J.Hiseman is vastly under-rated,maybe because he dosen't have one of those big drum kits with every bell & whistle attached.Thanks for sharing this album and in flac no less ! I love the fact that you actually bothered to put down a description for it, and, unlike other blogs, your description was accurate! I'm a huge fan of coheed and cambria, and I loved Tempest. Almost forgot to say: Thank you very much!!! Hello propylaen2001 - you're welcome!